ALSA Good in MythTV, I do the Hulu! I'm a very happy puppy. Now at least. There's a re-occurring mystery that happens with my MythTV boxes. Several versions and several builds of Myth work fantastically when suddenly KAPOW - the recording stops. Oh sure, it says it records crap, but then I try to take a look and nuttin' is on the file system. The only recourse I've been able to find so far is to drop the entire database and re-build it from scratch. Ick. This happened to me recently and I took the opportunity to take a deeper dive on getting the hardware working correctly. When I first configured my latest Myth box I settled with a non-working ALSA configuration and just piped audio to the OSS compatibility device at /dev/adsp. It worked, even though the DTS or AC3 surround sound pass-thru didn't work. This time I hunkered down and really tried to get the thing to work. I dug deeper into ALSA's digital out documentation, going through every step they illustrated to find how I could patch MythTV's audio to ALSA. 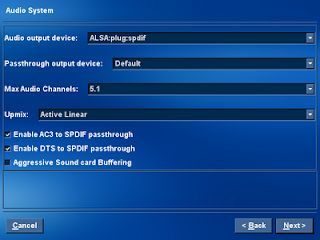 I pointed MythTV directly to spdif by specifying ALSA:plug:spdif for the audio output device. It works fantastically now and feeds pristine audio from the pcHDTV HD-5500. This had ALSA make spdif the default output and Hulu Desktop was happy. Woohoo! One additional problem however... for some reason both Hulu Desktop and MythTV rendered a bigger window than my TV could display. For some odd reason my TV only displays 97% of the content rendered by my video card. For example, if I tried to set my resolution to 1920x1080 (the maximum supported by my television), then MythTV's interface would be slightly too big to fit the screen - 57 pixels would be cut away at the left & right, 32 pixels trimmed from the top & bottom. To get around this I had to tell both Hulu Desktop and MythTV to shrink by 3% and then re-center themselves. For a 1920x1080 resolution this meant having MythTV shrink to 1863x1048 with an x,y offset (a.k.a. window origin) at 29,16. For performance reasons I switch to a 960x540 resolution for Hulu Desktop, which means a 932x524 window size starting at 14,8. Once I made those size & position tweaks everything fit perfectly. After a ton of trial and error I now have 5.1 channel surround sound for recorded HDTV broadcast streams (when available) and have Hulu Desktop & Netflix running on the living room television. Now I'm happy... no more cable TV, less commercials and tons of stuff on demand. If only Netflix would provide a Linux-friendly player the living room setup would be in pure harmony. Until then, I've got the closest thing to it and a smaller bill every month.